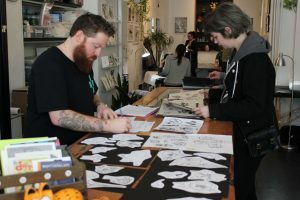 The first people in line at Black Medicine’s March 17 flash tattoo event pick out designs. It’s easy to accidentally walk past Black Medicine Tattoo on most days. 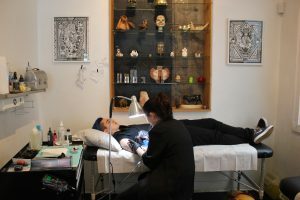 Sandwiched between two Chinese bulk-food stores, the tattoo shop just off East Hastings Street in the Downtown Eastside of Vancouver is unassuming at first. But at 11:30 on this Saturday morning, a line of around a dozen people is already forming outside. Emily Carr University student Patrick Takata is first in line. He doesn’t know exactly what he will get tattooed on his body today, or where, but that doesn’t bother him much. People select from available flash designs at Black Medicine Tattoo. 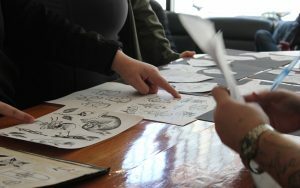 Today is flash day at Black Medicine, where artists prepare pre-drawn designs that are tattooed at set prices on a first-come first-served basis. 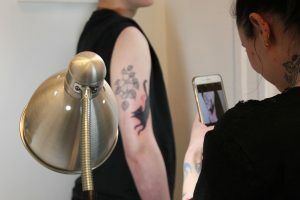 For clients like Takata, it’s both a chance to get a tattoo from artists who often have months-long waiting lists and an opportunity to avoid the hassle of booking a custom tattoo. Shortly after noon, the doors to the shop open. People in line outside are let in four at a time to browse through dozens of designs. “I’ll go with that one,” Takata says after browsing briefly, pointing at a black wolf on artist Rebecca Dewinter’s design sheet. Within an hour and a half, it will have a new home on his right bicep. Flash days are increasingly popular events at many shops across Vancouver and around the world. Black Medicine artist Alison Woodward says the flash days provide unique opportunities for both clients and artists. Patrick Takata gets tattooed by Rebecca Dewinter at Black Medicine’s flash day. Black Medicine hosts flash days every month or so, sometimes with themes like pets and Halloween and sometimes with a more general focus. Some days can run into the evening, depending on artists’ stamina. Today, Woodward comes with a prepared sheet that has seven different designs, ranging from a small leaf to a hand-sized illustration of a curled-up rabbit. She posted it to her Instagram page — which has nearly 10,000 followers — on the morning of the event. Some artists use social media to give fans a sneak peek of what will be available on flash days. For many, you have to show up to see what’s available. Breanna Branson stopped by the shop around 12:30 p.m. and selected Woodward’s rabbit design from the available sheets. After being told there was one person ahead of her, she returned at 2:00 p.m after a quick rendezvous to Tim Hortons. Alison Woodward tattoos a rabbit design. Branson selects the rabbit because it reminded her of her two pet rabbits. She decided to get it on her wrist between two existing tattoos: one of carrots and another of her cat in a spacesuit. Woodward agrees that it is an ideal spot. “It actually fills the space really well,” Woodward says. Within two hours of selecting the rabbit for her tattoo, Branson is under the needle. Black Medicine and other shops in the city regularly hold flash-focused fundraisers and events. These events have grown in popularity recently alongside a boom in the tattoo industry. Tattoo business licenses in Vancouver have tripled in the past 20 years, according to the city’s business directory. “We definitely exist in a time where the popularity of tattooing is more than ever before,” Woodward says. It takes almost an hour and a half for Woodward to finish the rabbit tattoo. As she traces the machine over Branson’s wrist, the two discuss everything from the Redwall book series to safe stick-and-poke tattooing practises. The shop buzzes with energy as all four artists — Woodward, Dewinter, Katie So and Derrick Fast — tattoo at once. In one corner, an intricate dragon finds its home on someone’s calf while in another a woman gets an elaborate pomegranate etched into her shoulder. After putting the final touches on Branson’s tattoo, Woodward steps back. Breanna Branson got a tattoo of a rabbit in honour of her two pet rabbits. The two discuss aftercare and how to arrange an appointment to touch up the shaded areas. As she’s about to return to the front counter to pay, Branson turns back. “Can I give you a hug?” she laughs, and the two embrace, already discussing Branson’s next tattoo. Over the course of the day, 14 people got new tattoos and a dozen more reserved designs for future appointments. Takata says it was worth coming early to be first in line. He is overjoyed with the design he got from Dewinter. Branson shares a similar sentiment. As Woodward cleans her station in anticipation of the next person, she talks about why she loves tattooing flash. Social media plays a big role in how artists promote their work. She says she also loves getting flash tattoos herself. “It takes a lot of the onus off of the design process and things. Cause you’re like ‘I like that, let’s do it,'” she says. Friday the 13th has traditionally been a flash day at tattoo shops around the world since the 1990s. Black Medicine’s next flash event will happen on Friday, April 13.